Dice has announced that new details on 'They Shall Not Pass' is coming next week. Next weeks drop of information will likely come in the form of a livestream or trailer, with DICE slowly revealing more information via their website or twitter page in the following weeks. Hopefully, a tease of a few new weapons and maps coming to the DLC will be seen, and who knows, we may get to see the K-Vagen Behemoth being teased. Along with new in-game footage, we should also be expecting an official release date for the DLC. The video clip included with Battlefield’s tweet also mentioned that players who own the Battlefield premium pass will be able to access and play the DLC a whole two weeks early, so it might be worth investing if you haven't already. With March rapidly approaching us and new information about They Shall Not Pass just beyond the horizon, let’s take a look at everything we know about the expansion so far. 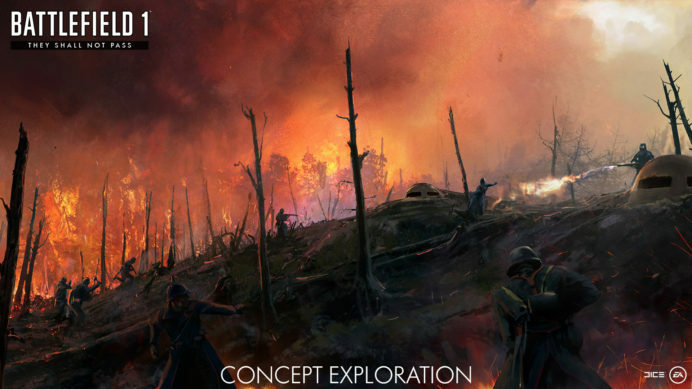 They Shall Not Pass will feature a variety of new weapons and maps along with a new faction, the French Army. We also know that the maps within this DLC are inspired by two famous World War 1 battles, the Battle of Verdun and the Battle of Soissons. Realism is Dice’s main priority in this DLC, and bringing these historic battles into the game was something the design team cared about deeply. Intense forest fires raged in every direction you could see and soldiers reported seeing pillars of smoke rise above the horizon, so expect a lot of this within these maps. These stories inspired the creation of multiple maps in the expansion and Dice assures players that jumping into battle on these maps will replicate the feeling of fighting through the harsh winter of 1916. Through Verdun’s 9 month struggle, soldiers weren’t only fighting opposing armies, but the rugged and harsh environment as well. Trenches and tunnels were key in keeping safe from the barrage of artillery shells, so expect tunnels and trenches to be a key part of maintaining control on these maps. The Battle of Soissons was another inspiration for the expansion, this battle, however, focused more on vehicular assaults. French tanks, including the Behemoth “super-tank” were involved in the Battle of Soissons, and players can expect that vehicular dominance will be the decisive factor in victory or defeat on these maps! As new information regarding Battlefield 1’s first expansion, They Shall Not Pass, becomes available, be sure to check back here for all the latest updates! Will you be jumping into battle as a French soldier this March? Let us know in the comments below! Update - DICE has now revealed Battlefield 1's They Shall Not Pass DLC content, which you can read about here.